Pirates have green teethâ€”when they have any teeth at all. I know about pirates, because one day, when I was at the beach building a sand castle and minding my own business, a pirate ship sailed into view. 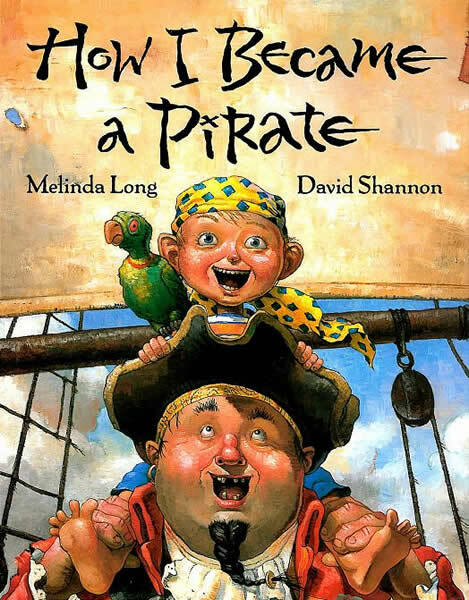 So proclaims Jeremy Jacob, a boy who joins Captain Braid Beard and his crew in this witty look at the finer points of pirate life by the Caldecott Honor-winning illustrator David Shannon and the storyteller Melinda Long. Jeremy learns how to say scurvy dog, sing sea chanteys, and throw food . . . but he also learns that there are no books or good night kisses on board: Pirates dont tuck. A swashbuckling adventure with fantastically silly, richly textured illustrations that suit the story to a T.
How I Became a Pirate by Melinda Long, with bright and densely colored illustrations by David Shannon, is the funny and sly account of a young boy who makes a brief foray on a pirate ship before realizing he wants to be home in time for soccer practice and a bed-time story.